Here you'll find many of the common questions about the Katy Trail, but also be sure to check out the Katy Trail Forum for lots of good questions, answers, and discussions. How hilly is the trail? See the Katy Trail Elevation chart to get a good idea of where the trail is flat and where there are slopes. The trail was built on former railroad tracks and closely follows the Missouri River (east of Boonville), so for the most part it's exceptionally flat, as you might expect. However, you will find some long gradual slopes between Boonville and Clinton. There's also a steeper but very short uphill at the Boonville bridge. Where is the best place to park, when driving from St Louis or Kansas City? Click the following link for a discussion of Katy Trail parking most convenient to St Louis and Kansas City. How can I get a printed map of the trail? The Missouri Department of Natural Resources produces a very nice trail map, which they will send you free of charge. Just call the MO DNR at 660-882-8196 or 800-334-6946, and ask for the Katy Trail map. The DNR tries to keep trailheads stocked with these maps. You can also buy a sturdy laminated Katy Trail map here on BikeKatyTrail.com. It contains not only a map but mileage listings, town services, and other useful information. When is the best time to use the Katy Trail? Any time is great, but my preferences are May, September, and October. Before May, some of the businesses are closed for the season. In late May and June, Missouri has frequent thunderstorms or just rain, so you might get drenched or have to seek cover. July and August are hot and humid, but things cool off in September (mainly late September). Of course, the natural beauty of the trail is enhanced by fall foliage, generally peaking in mid-October. These are only generalizations, you could end up with a miserably hot day in early May, or a cool and refreshing day in August. Follow this link for Missouri average temperatures and precipitation, and current Katy Trail weather conditions. As for the best time of day, mornings are obviously cooler, and there's a better chance of seeing wildlife. But there is a downside to being out there early in the morning: if you're the first person of the day on a wooded section of trail, you might be surprised by the occasional spider web in your face! What is the trail's surface like? It is covered in crushed limestone, which packs hard and is suitable for running, hiking, or any kind of bike (though mountain bikes and hybrids might be more comfortable than road bikes). For runners, the surface absorbs impact well, and is much easier on runners' legs than cement or asphalt. The crushed limestone can be dusty; you and your bike will get dusty. For multi-day bike rides, you may want to bring along something to clean your chain. The trail can get a little soft during extended rainy periods. After a rainy period, some horses may leave light hoofprints on the equestrian part of the trail. The trail surface is not suitable for inline skating. For perspective, here is a close-up photo of the trail surface. See the following question & answer for an issue related to the limestone dust. The first day we started out and at the first sag stop I applied sunscreen. Later at lunch I felt some burning around my ankles. Thinking I had missed a few spots I applied more sunscreen. That evening I had extensive blotches on my legs. Another rider in the group observed them and suggested that they were chemical burns from the limestone dust. I treated the burns with cortisone and bought knee high socks for the rest of the ride and that stopped the problem. Several other riders in the group complained about minor burns. I think mine were the result of the combination of sun screen to hold the dust against the skin and sweat to activate the limestone. I've not heard or seen any advisories at any of the sites warning riders of this problem. If that other rider hadn't been on point with their advice I might have had more serious complications that would have caused me to abort the ride. How safe is the Katy Trail? It's very safe - there is little or no crime, and many regular trail riders have never felt the need to lock their bikes. Of course it's also much safer than cycling or running on a road with traffic. Here's a county-by-county list of hospitals and emergency phone numbers for the various county sheriffs offices, just in case. The biggest danger, in my opinion, is crossing roads and highways at intersections with traffic, such as multiple crossings of highway 94 on the eastern end of the trail. Cars approach at 60MPH, and drivers often are not paying attention. Be careful!!! Is there any dangerous wildlife? It's always best to keep your distance from any wildlife. But in particular, Missouri is home to some species of venomous snakes. 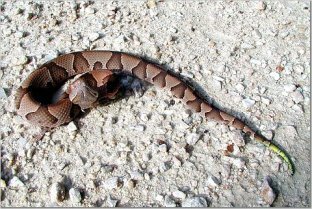 Brad Wilson spotted the following two "don't mess with me" snakes, a 9 inch baby copperhead, and a 3 foot timber rattler. Needless to say, this type of photo is best captured with a very high-power telephoto lens! 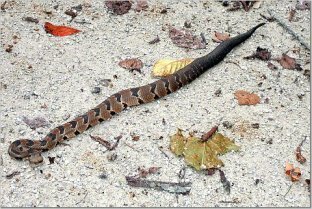 I have ridden the trail many times, and have never spotted either of these types of snakes. But just be aware they are out there. Are horses allowed on the Katy Trail? Yes, horseback riding is allowed between Clinton and the Sedalia Fairgrounds trailhead, a total distance of approximately 35 miles. Trailhead parking lots along the equestrian section of the Katy Trail are designed to accommodate horse trailer parking. In Clinton, you'll have to park your trailer at the Henry County Fairgrounds, just across Price Lane from the trailhead. Equestrian use is also allowed between Tebbetts and Portland - use the Mokane trailhead for horse trailer parking. See this KT Comment discussion thread for a discussion of concerns regarding the horses on the trail. As this sign indicates, cyclists and runners/hikers should yield to horseback riders. Be careful not to startle horses when approaching from behind. Will my cell phone work on the trail? Yes and no. Most areas have coverage, although some of the more remote areas are not covered. Naturally, areas around towns and cities are more likely to have coverage. In my own personal experience (Verizon), I only see gaps in service around Windsor and Bluffton. Definitely bring your cell phone along; you never know when you'll need it! Can I cross the Missouri River Bridge to visit Jefferson City, Hermann, or Washington? The Washington bridge is only wide enough for one car in each direction, and should not be attempted on a bike or on foot. If you are staying at a B&B in Washington, they might give you a ride from the Dutzow trailhead. The Hermann and Jefferson City bridges both have separate bike/pedestrian sections, keeping you safely segregated from motor vehicles. I'd strongly encourage side trips across the Hermann and Jefferson City bridges; you'll be rewarded with magnificent views of the Missouri River. See the Hermann page, Jefferson City page, or Washington page for more information on these towns. Also: Washington MO Hotels and Motels. I don't want to go it alone - how can I get support in planning my trip, arranging lodging, etc.? There are touring companies and various organized rides that have already worked out all the details for excellent Katy Trail trips. Generally they will provide or arrange any needed transportation and lodging, offer maps, routes, and directions, etc. You can leave the planning to them, so your only concern will be getting out there and enjoying the trail! Click the following link for a Plan-a-Ride list of companies offering tours on an ongoing basis. Or, check the Katy Trail events page to look for one-time organized rides along the trail. Can I get my bike shipped for a one-way ride? There are shuttle services which will carry you and your bike from one point to another - perfect for a one-way point to point ride. Click this link for a list of all shuttle services along the Katy Trail. Another option is to ride the train in one direction, with your bike, and then pedal your bike back in the other direction. See the next question & answer for a discussion of this option. Some B&Bs may let you ship your bike to them. Can I ride the train to the Katy Trail? Many cyclists ride Amtrak (with their bikes) to some point on the trail, and then pedal back from there. For example, St. Louis-based riders and their bikes could board Amtrak in Kirkwood, ride the train to Sedalia, and then pedal the Katy Trail back to St. Charles / Machens. Regarding taking the train to Washington, see the question & answer above, discussing crossing bridges between this city and the Katy Trail, and the Katy Trail Amtrak guide mentioned in the following paragraph. See the Katy Trail Amtrak guide for a detailed discussion of riding Amtrak along the Katy Trail. Is camping allowed along the trail? Impromptu "stealth" camping is not allowed along the trail. However, there are several private campgrounds and public parks that allow camping. Click the following link for a list of all camping options along the Katy Trail. What's the best kind of bike tire for the Katy Trail / can I use a road bike? In general, wider tires are better. If you're riding a mountain bike, hybrid, or comfort bike, your tires are fine. But the Katy is definitely suitable for road bikes, and you'll see plenty of them out there. The crushed limestone packs down hard and gives you a surface nearly as solid as asphalt, unless it's been raining a lot. But there are a few places where it's not packed as hard, or where the trail crosses gravel roads, that could be a little rough on road bikes. Most of what I've heard from road bikers is that any tire 25mm or wider is fine for the Katy Trail. I've seen some riders say they did fine with 23, but most suggest 25 or wider. For best results, go with the widest cross-tread tire your rims can handle. You do not need knobby tires, something with light tread is ideal. If using skinny tires, you may want to inflate to a slightly lower pressure than you use on pavement. Road bike on the Katy? Trail condition...what bike to ride? Speaking of tires: always bring spare tubes and a pump or compressed air. There are thorny plants which have given flats to many a rider. Be prepared for possible flats! I'd like to ride on the trail but don't have a bike. Can I rent a bike? Yes, there are businesses at many points along the trail offering a wide variety of bikes for rent. Follow this link for a list of bike shops along the Katy Trail, many of which offer rentals. Also, some of the B&B's have bikes that they make available to their guests. For a multi-day trip, you'll need more stuff - maybe a lot more, depending on how long you'll be riding and how self-sufficient you plan to be (not to mention the fact that you'll need a trailer or panniers to hold everything). Here's a discussion on the Katy Trail Forum about what to pack. Yes, the trail is flat and easily reached by wheelchair from nearly all trailheads. One exception is the St Charles 364 parking lot (not the main St Charles Trailhead), which has a steep 1/4 mile long ramp that some wheelchair users might not want to tackle. Note that Katy Bike Rental in Defiance offers wheelchair bikes, handcycles, and other specialized equipment to make the trail more accessible to handicapped individuals. Although motorized vehicles are banned from the trail, motorized wheelchairs and scooters for the handicapped are allowed. Be aware that your wheelchair or mobility device will get dusty from the trail surface. Has anyone ever ridden the entire trail in a single day? Amazingly, yes. We maintain a list of people who have ridden the Katy Trail in a single day, or covered the whole trail on foot. If you've accomplished either of these feats, let us know. How do I get my business listed on BikeKatyTrail.com? If your business is on or near the Katy Trail, and of interest to trail users, then BikeKatyTrail wants to list you. Please visit the Contact Us page for a list of the info we need, and what address to send it to. There are no fees whatsoever to be listed here. Want to get your message out to thousands of Katy Trail users? BikeKatyTrail offers reasonably priced advertising to a highly-targeted group of potential customers, most of whom are actively planning a Katy Trail trip. We'll even create an ad for you! For more details, check out the Advertising Rates page. I spotted an error on the site. How can I report it? I appreciate your help in keeping the site 100% accurate (so do future visitors to the site!). Please contact BikeKatyTrail.com with details of the error, and we'll fix it ASAP. I love your website - what can I do to help support you? Really, people do ask this! If you've found BikeKatyTrail to be a useful resource, please help spread the word by telling other Katy Trail users about the website. Please support our advertisers - they make the website possible. And when you patronize a trail business that you saw listed here, please tell them that you saw them on BikeKatyTrail.com. 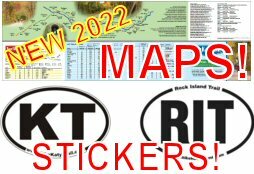 Finally, please consider getting a Katy Trail t-shirt, patch, map, and/or sticker - they're really cool! Ray Scott is an avid cyclist and a six-time marathon finisher. In August 2012, my son and I rode the trail from end to end (actually we crossed the state of Missouri, from the Kansas state line to the Mississippi River, using the Katy Trail for the majority of our 310 mile ride). In August 2013, we rode from Machens to Clinton over four days. "As a software engineer who builds commercial websites for a living, I decided to build the ultimate Katy Trail website with all the nitty-gritty details that cyclists and runners need. I hope you'll find BikeKatyTrail to be a useful resource for all your Katy Trail information needs.